Muntjacs, also known as barking deer and Mastreani deer, are small deer of the genus Muntiacus. Muntjacs are the oldest known deer, thought to have begun appearing 15–35 million years ago, with remains found in Miocene deposits in France, Germany and Poland. The present-day species are native to South Asia and can be found in Sri Lanka, Southern China, Taiwan, Japan (Boso Peninsula and Ōshima Island), India and Indonesian islands. They are also found in the lower Himalayas and in Burma. Inhabiting tropical regions, the deer have no seasonal rut and mating can take place at any time of year; this behaviour is retained by populations introduced to temperate countries. 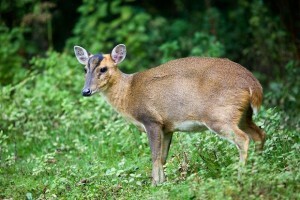 Reeves’s muntjac have been introduced to Northern Ireland in 2009; they have been spotted in the Republic of Ireland in 2010, almost certainly having here with some human assistance. Males have short antlers, which can regrow, but they tend to fight for territory with their “tusks” (downward-pointing canine teeth).